Cuzinlogic is giving away a $10 Itunes gift card and a $10 Amazon gift card. 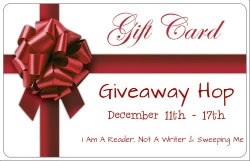 Giveaway ends 11:59pm on December 17 2012. All times are Eastern Standard. Enter here now! You can jump from all the blogs on the hop to win more gift cards also!